Tomato Pie. I’ve made 15 of these since August. 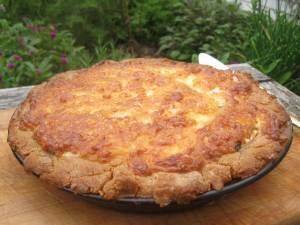 You use store-bought biscuits for the crust, add thick slices of tomatoes and chopped fresh basil, then top the whole thing with mayonnaise and cheddar cheese before baking. The recipe. 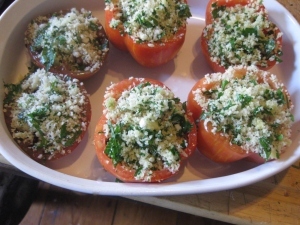 Stuffed Tomatoes Provencal. A French classic that’s truly easy to make. 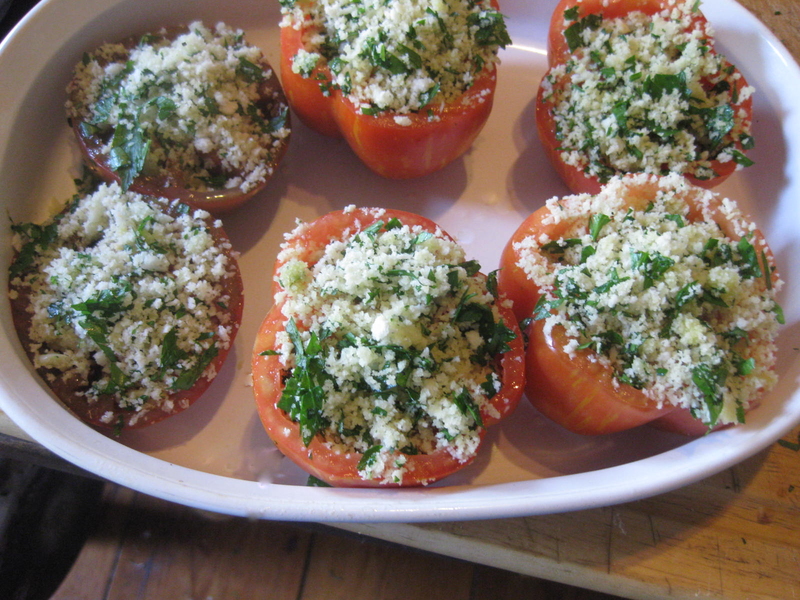 The filling is an aromatic blend of garlic, parsley and fresh bread crumbs. I like to fill the tomato halves in advance, and then bake them just before serving. Lazy Sunday Tomato Sauce. This is the sauce I freeze each autumn. I call it “Lazy Sunday” because it takes several hours to cook the tomatoes down to a thick consistency. Richly infused with garlic and basil, I love to serve this over pasta for a simple fireside dinner in winter. Canning. This is a new skill for me. But my friends over on Facebook talked me through it. Canning isn’t hard work; it’s just time-consuming. To insure the tomatoes are acidic enough for hot waterbath canning, I add one 1/2 teaspoon of “Fruit Fresh” to each pint of sauce. Otherwise my sauce is just pure tomatoes which have been blanched, peeled, and somewhat seeded. I’m embarrassed to show you the tomato sandwich I eat daily for lunch (just like Harriet the Spy). Let’s just say it involves 2 thick tomato slices, 1 slice of homemade mozzarella, 3 leaves of basil, and mayonnaise-slathered Wonder bread. Shame on me. So how are you dealing with the tomatoes from your own garden? Got any recipes you can post (or link to)? Any preserving tips to share? Do any of you roast your tomatoes before turning them into sauce? (This roasting-idea sounds rather intriguing.) Spill your pulp, please, in the comments thread below. I, too, have been eating tomato, mozz, basil sandwiches for days! i love this time of year! I have also been making salsa everyday. I roast about 10 romas, 3 cloves garlic, 1 onion and poblano. After they are roasted and skinned I pull out the food processor mash up the latter 3 ingredients, add a bit of salt and cilantro and then pulse with tomatoes. We eat that with chips or I have added it to rice, quesadillas, etc…I keep thinking of canning but we seem to eat what we've grown too fast. We had a much later season this year because of all the rain in May. We were about a month behind! The waterbath canning is probably best. I had at one time neighbors from Italy who used an old steel drum filled with canning jars and boiling water over an open fire in the backyard. They ate all year from their huge garden. I'll never see that again, that's for sure. How about donating some to a soup kitchen or shelter?? Anonymous – looks great…and would freeze well, too. cpage2323 – welcome. Yeah, another tomato sandwich fan! And I can practically taste that salsa…will have to make it. Lana – That's what I'm trying to do: eat all year from my garden. Love the idea of giving surplus to a soup kitchen or shelter. These are trying times for lots of folks. Kevin, I do what you do: waterbath can pure tomatoes. And I've made your tomatoe pie several times since you first posted about it last summer. It's delicious! Whoops! That's tomato (no “e”) pie! Ah-ha! I'm not the only one w/ a tomato sandwich for lunch everyday! Mine is on a honey wheat bread, and I chop the basil [Purple Petra, so pretty!] and mix it with fresh ground pepper, garlic powder, and a couple of oregano leaves IN the mayo. It comes out a lilac color. It's so good. But canning is something I want to try out… SO BAD. Maybe next year? Adele – that tomato pie is really something, huh? Donna B. Lilac-colored mayonnaise…how chic is that? The brushetta sounds DIVINE. At what temp do you roast the tomatoes? Well, I guess I can't leave URLs here? Do a Google search for “tomato confit chezpim” for detailed instructions on canning dried tomatoes preserved in oil. Debbi – you can post URLs here. No sure why it didn't work for you. Anyway, I had a look — and they are beautiful! But…Any concern about waterbath canning when using olive oil? Try to re-post your blog link, OK? Like you and so many of the others who've commented, I have tomatoes coming out of my ears — which makes me happy, since last year was such a bust for tomatoes in my region. I planted 17 plants this year and all ended up positively dripping with toms. In addition to lots of black bean and tomato salsa, tomato on bruschetta, sliced tomatoes with balsamic vinegar and gorgonzola on a big plate for lunch, fried green tomatoes, and pizza sauce, I've canned a tomato chutney that goes beautifully with garbanzo beans over rice, a chunky tomato and balsamic vinegar tomato sauce (recipe from my sister Pepi, another of your readers! ), and green tomato pickles (to die for). Sauté onions in olive oil until tender. Add tomatoes, vinegar, and garlic. Bring to a boil and reduce until liquid is almost gone. Stir in basil and seasonings. Remove from heat for about 30 minutes to allow flavors to mingle. Reheat for serving. I made and froze several pints of your Lazy Sunday sauce one year ago at this time. It was gone within a month! Will have to make gallons of it this time. My tomato plants didn't amount to much this summer. I guess they don't thrive on neglect. So I'll be buying from the farm market. Tammy – Mm, Mmm, and Mmmmmm!Thanks! Yolanda – Glad you liked the Lazy Sunday Sauce for freezing. I'm going to triple — if not quadruple — the quantity I freeze this month, too. Easiest Roasted Tomatoes EVER: cut into wedges, toss with olive oil and salt. Throw in some smashed garlic cloves. Spread in large sheet pan. Roast at 400 for 40-60 mins. Some parts will sort of caramelize. Holy Moly, you will eat them off the pan with a fork. Promise! Abby Taylor – nice to meet you. Well, encouraged by your comment and Donna B's comment, I'm roasting tomatoes this weekend. Definitely. I can imagine my taste-buds dancing to the tune of the caramelized, garlicky goodness! Let's see, I canned tomatoes, tomato juice, and stewed tomatoes. Also made some red wine freezer tomato sauce and oven dried a cookie sheet full of yellow pear (I call them lightbulbs) tomatoes with italian seasonings, olive oil salt and pepper. The last is great for adding to tomato sauce over pasta. I have also practically filled my freezer with freezer bags full of sweet 1000's and lightbulb tomatoes. More are covering my counters…yikes! Enchiladas sauce, sweet and sour sauce, spaghetti sauce, salsa. The best thing to do with tomatoes though is go out to the garden and warm off the vine!! I slow roast tomatoes with garlic and onions, then bag and freeze them. This saves a lot of space in the freezer as a large roasting pan full of tomatoes reduces down to a couple of bags. Makes a fabulous sauce! Marilyn — “Yikes!” is right. Your kitchen (and freezer) must look just like mine. caren – You mentioned Sweet & Sour sauce. Details, please! Janice – Slow-roasted tomatoes with garlic and onions…yessssssssss. Kevin–Tomato sorbet is amazing! Ted and I tasted this first at the (discontinued) Berkshire Tomato Fete. We came up with our own recipe, which I've attached. In a medium saucepan over low heat, blend sugar, water and tomatoes for 1 hour, stirring constantly. Transfer the pan to an ice bath to cool. Transfer the cooled tomatoes to a blender or food processor and purée. Add the lemon juice and vodka and puree. Transfer the pureed tomatoes to an ice cream maker and process. When serving, consider garnishing with Basil or mint leaves. …And, of course, now that I've already posted the recipe, Ted is quality-controlling me and telling me to suggest that, when trying the sorbet recipe, to use meaty tomatoes (like Brandywines) or similar heirlooms, with stronger flavors and not too much liquid (e.g., Green Zebras are too wet). Kelly & Ted – Oh, oh, oh! A tomato sorbet that includes vodka? Sounds so weird and wonderful that I absolutely, positively must try it. Thanks for posting the recipe! Kevin–I hope that you enjoy. The vodka is really for texture–It makes the sorbet crystals smaller, and the sorbet smoother. It may require slightly more time in the ice cream maker. Combine the tomatoes, sugars, ginger, lemon, spices, and 1 1/2 tablespoons of the vinegar in a medium-size, heavy-bottomed saucepan. Add a pinch of salt and a pinch of cayenne and cook over medium-high heat, stirring often, until the tomatoes cook down to a jam and the sugars are bubbly and caramelized, 15-20 minutes. Set aside to cool. Add the remaining 1/2 tablespoon vinegar to taste. 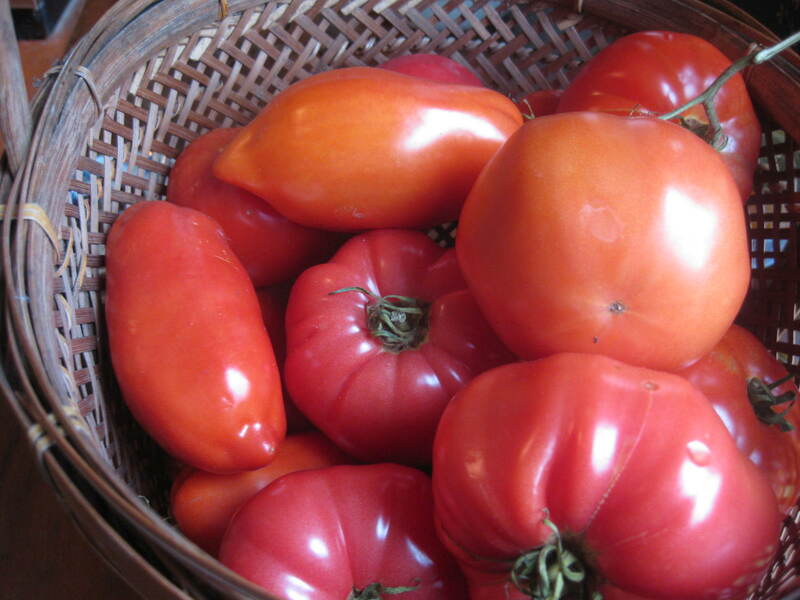 w8in4dave – Tomatoes, hot spices, brown sugar and ginger — talk about tantalizing the taste-buds! Will make. Love tomatoes !!!! 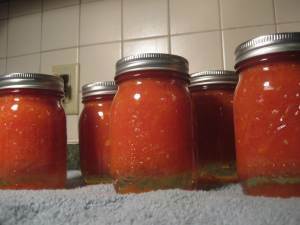 Usually we can all our tomatoes, last year I had surgery and spouse did all the “canning”. Brought all tomatoes in, rinsed them in sink full of hot water, cored them, tossed them in the blender(raw), placed them in freezer bags and froze them. After i was back on my feet, the end of November i made whatever i wanted with them. Used some to make tomato soup. it was delicious. No more canning tomatoes for me. 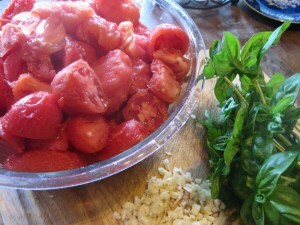 add thawed tomatoes, let cook down about 20 minutes, salt and pepper to taste. thicken with cornstarch and cream if you like the creamed version. You mentioned slow-roasting tomatoes…how similar is that to dried tomatoes? I am thinking of drying them but have no idea how to go about it. My husband and I plant about 40-60 plants a year. Each year we say we have to much…but come spring we really go overboard. we also dry them and place them in a mason jar ..this is great to add to any dinners you make in the winter time. Stewed tomatoes that went into everything – I will make twice as much this year! and blanched the corn, green & yellow beans, cauliflower, broccoli use in the winter – our freezer was full and we loved knowing as we ate it where it came from!